The QUOLF GOLF putter is one of a kind, and it comes in a simple design. In fact, it might not even look like a putter if you have never seen a similar one before. But despite its simple design it still uses some high-quality materials to make it sturdy and very durable. However, what makes it appealing to most golfers is that it will work for both right and left-hand golfers. This putter provides some very responsive swings when on the green and it will also be easy to swing even for beginners. And its small size and lightweight also mean that it will be easier to control than the regular putters. Material: This two-way putter combines different materials to create a reliable, durable and easy to swing golf club that you will enjoy using for long for your casual golf games. Two-Way Putter: It has a two-way design that means that it will work for both left and right-hand oriented golfers. Weight and Dimensions: The dimensions of this putter are 34×2.6×0.5 inches which mean that it will be long enough to swing comfortably for players that are up to 5’8 ft tall. However, it might feel a little short for the golfers that are taller than this. This golf putter weighs only one pound, and so it is quite lightweight and comfortable to swing for most golfers. This putter works well for both right and left-hand golfers. The lightweight makes it easy to swing. It has an excellent grip that is very comfortable for your hand. Although the design is simple, it will still be very appealing to most golfers. It comes at a very affordable price tag. The high-quality materials give it a sturdy appearance and also make it very durable. This golf club is not long enough for the taller golfers. It has a sharp smell of rubber when you first get it. 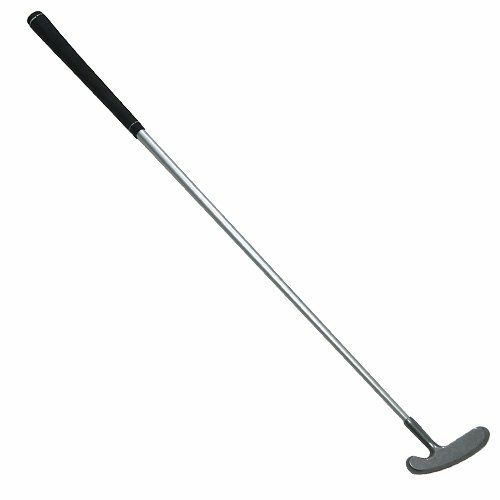 Most golfers will take some time to get used to this style of putters. You do not always have to stick with the traditional putter styles when playing some casual golf because this unique two-way putter can also work fine. It is a lightweight and easy-to-swing golf club, but its most impressive part is the fact that it will work for both left and right-hand golfers. Whether you want to play a few rounds with friends in your neighborhood course or have a mini golf course in your compound, this will be a fantastic putter for you. Despite the fact that there are a few complaints from some golfers, such as the length not being enough for taller players and the strong rubber smell this is still worth trying out. And this is more so given its affordable price tag.